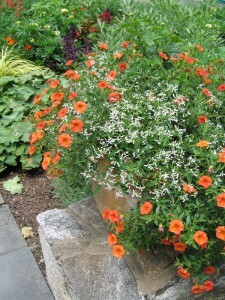 A year ago I blogged about the subject of my Containers that Won’t Quit lecture, which is how to compose containers that will look as good in September as they do in June. 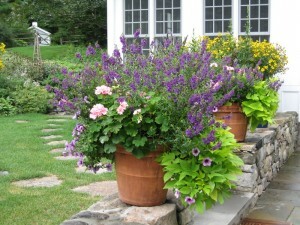 That prompted a request for a post recommending great shade tolerant plants for containers. 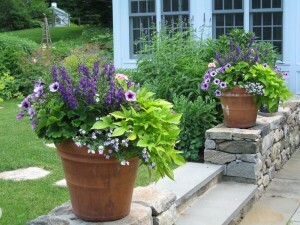 In my area, Memorial Day weekend is when it’s considered “safe” (reliably free from frost) to plant annuals and tender perennials, so it’s often when people plant their containers. 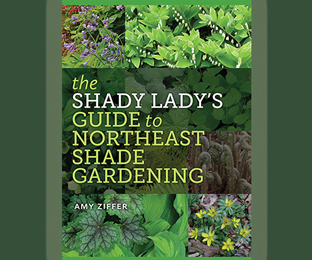 In light of that, here are some recommendations—annual and otherwise—for your shade containers. Let me start by saying that with a little effort and a healthy dose of flexibility, you can have just as fine a container display under the cover of trees as in bright sun, but there is some fine print. I can’t devote space here to the perennial topic (no pun intended) of different kinds of shade, but you’ll find an explanation here. The plants I mention in this post should all perform well in anything up to moderate shade. Your options for attractive compositions will expand considerably if you’re willing to use plenty of colorful foliage and not restrict yourself to flowering plants. Interestingly, many of the best plants for this purpose are things you might already know as houseplants or hardy perennials. Second, a rule of thumb: In shade, gold rules. That is, no color shows up in the shadows better than gold—not even white. Creeping Jenny (Lysimachia nummularia ‘Aurea’) is a fast-growing plant whose long stems bearing bright, penny-shaped leaves will trail beautifully over the sides of containers. It’s sold as an annual in garden centers in spring, but it’s actually a perennial supposedly hardy to USDA Zone 3, and I can say for sure it’s hardy here in Zone 5. I’d also try cultivars of the perennial grass Hakonechloa macra, which has a lax, compact and clumping habit. ‘Aureola’ and ‘All Gold’ are two choices that will give you a bright splash of virtual sunshine to light up shady spaces. For trailing plants, don’t forget those two old standbys, ivy (Hedera) and vinca vine (Vinca major). Both come in variegated forms, with a true plethora of choices among the ivies. I happen to like the duckfoot ivies, whose sharply lobed leaves offer an additional point of interest. Five wonderful houseplants for container use are asparagus fern (Asparagus densiflorus, usually ‘Sprengeri’), Southern maidenhair fern (Adiantum capillus-veneris), polka-dot plant (Hypoestes), peace lily (Spathiphyllum) and Schefflera. The first two will add a feathery, delicate texture to your container combinations, while I often use the last two as solitary specimens filling an entire container on their own. Peace lily is one of the very best performng plants for very low light situations because it has attractive, glossy, lance-shaped leaves in profusion and it produces showy white flowers continuously. Schefflera comes in a gold-variegated form made all the more attractive by the fact that no two leaves have the same coloration. As an added benefit, both can be overwintered easily in a bright spot indoors and then returned to outdoor containers year after year. The lovely Southern maidenhair fern, in contrast, needs such high humidity during the winter months that I simply discard it in fall and buy new in spring. Finally, little polka-dot plant, a common windowsill adornment, is a nice filler at the edge of a container where it can peek out and provide a cheerful splash of pink or white. In light shade, and still considering foliage plants, try tropicals such as Alocasia and Colocasia. Depending on the selection, both have the potential to get quite large, so generally speaking these will be choices for larger containers. They’ll give you a lushness that will stand out in a northern landscape. 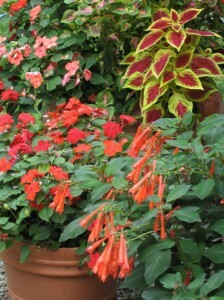 And of course I can’t neglect to mention coleus (Solenostemon). In the north, most coleus actually need brighter conditions than their reputation suggests, but they’re great plants for spots with morning sun or bright but indirect light. Some of my favorites are ‘Kingswood Torch’, ‘Festive Dance’ and ‘Butter Cream’. 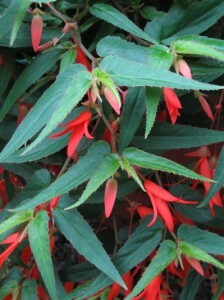 The selection of flowering plants that will bloom all summer in northern shade is slim. For lighter shade, you can get away with fuchsias (I recommend two upright types: orange ‘Gartenmeister Bonstedt’ and pink ‘Mrs. J.D. Fredericks’—see above) and trailing wishbone flower (Torenia). 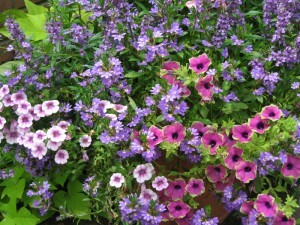 The Summer Wave series of torenias will produce a waterfall of flowers in shades of purple, blue, rose and even pale yellow. 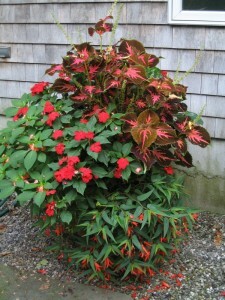 In deeper shade, you’re really limited to begonias and impatiens, but I would use the dragon wing begonias for better disease resistance and denser growth than their alternatives (non-stop and wax-leaf begonias) and and Fusion series impatiens in addition to Impatiens walleriana. 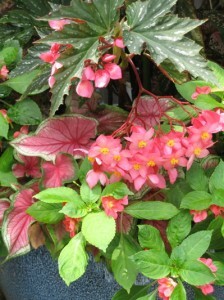 For a strikingly different begonia, try one of the new selections of Begonia boliviensis that have only been on the market for a couple of years. Their trailing habit makes them especially welcome on the scene, because few flowering plants for shade are pendant. I mentioned that many perennials also make great container plants, with the added benefit of being able to overwinter them in the ground outdoors and then replant them in your containers in spring. 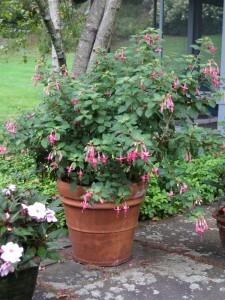 You might even find that they overwinter in your containers just fine, eliminating that extra step. Virtually any hardy fern that’s the right size and shape for your container would be an excellent choice for shade. Hostas, too, are a good choice no matter the size of your container because there are hostas ranging from miniatures to monsters. The drapey dead nettles (Lamium) such as ‘White Nancy’ will provide both flowers on and off throughout the summer and good frosty foliage. Finally, many selections of the perennial Heuchera (coral bells) have been introduced in the past few years with mouthwateringly beautiful foliage. Tantalizingly, selections in the Dolce series are all named after foods! ‘Key Lime Pie’, ‘Peach Melba’ and ‘Blackcurrant’ will spice up your shade containers with colors to rival those of any flowers.